Looking for an accounting solution? | You've come to the right place! Single & multi-user versions with multi-currency, multi-location warehousing and enhanced inventory control features. With the passing of all 5 bills by Dewan Negara, it is now confirmed that GST has been abolished and SST will be re-introduced. • The last date for GST is 31st August 2018. • SST will be implemented from 1st September 2018. Is your business subject to SST? The threshold for registration is RM500,000.00 turnover. 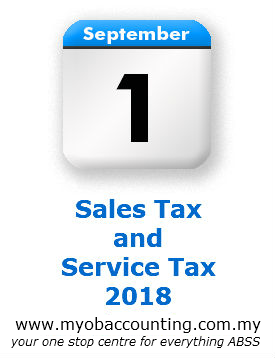 Those that are already GST registered and are liable for registration will be automatically registered for SST. In such cases, Customs will notify the business by letter. If you have not received any notification, chances are you are not required to register for SST. However, it is always best to verify this with Customs. For both Sales tax and Service tax, the threshold for registration is RM500,000.00 over a 12 month period. Businesses are required to register within 30 days of reaching the threshold. Businesses can register online through the Custom's mySST system. Looking for an accounting solution?